Rocky places, Garigues, Dry Woods, Hills, Cliff tops and sometimes at valley tops. Common, especially in garigues and cliffs as at Dingli, Mellieha, Bahrija, Delimara, Qrendi and at valley tops of Wied Encita. Also Common in Gozo. The leaves are arranged in whorls of 3 and sometimes of 5 around a stem axis, which its length can vary in any length normally up to 15cm. The whorls are very close to each other. The individual leaves are needle like, sessile and measure 1.5mm in width and about 6-10mm in length. The side of the leaf facing down have a central, pale, groove running along the axis. At the apex of the leaf branches there are the infloresences, a cluster of numerous light pink flowers often pendulous due to their long slender purple pedicels (flower stalks) and arranged in racemes . Flowers outgrows as racemes. The colour of the flowers ranges from pink to very pale (off-white) pink. Some plants form flower clusters at the central part of the leaf axis, not only at the apex. Each single flower consists of 4 small light pink sepals, and an inflated tubular sympetalous corolla. Just at the opening of the corolla, the brown / purple anthers protude out giving the false impression that the outer brown 'ring' is part of the corolla structure. The corolla (excluding anthers) is 5-6mm long and about 3mm wide, while its pedicel is about 2-3 times as much longer. Each flower have 8 stamens made up of purple-brown anthers and pink filaments and also a single hair-thin pink stigma which is longer than the stamens by 2 or 3 mm. The style runs down the corolla into a central, inferior ovary which is speherical in shape and magenta in colour. The plant has the following medicinal properties: . An undergraduate student, Maureen Delia, of the Department of Pharmacy, University of Malta carried out a Pharmacognosy project on this plant . She describes how she made a decotion of the plant and extracted Glycosidic acid, an alpha-hydroxyacid. Glycosidic acid is used for the treatment of photodamaged skin due its anti-wrinkle and exfoliant properties. Topical glycolic acid accelerates the resolution of erythema in irradiated skin due its anti-inflammatory properties. The Acid is also used in peels (known as glycolic acid peels), much used for the treatment of seborrhoeic keratoses, actinic keratoses and verrucae. Other uses of Glycosidic acid comes from its polymer compound, used as a surgical suture material and in the production of microspheres for controlled delivery systems for a number of drugs. Also, the acid or its salts can be used for the topical treatment of aphthous ulcers including cancer sores. Other important extracts apart glycosidic acid were tannins (antiseptic) and ursolic acid (anti-inflammatory) ; properties which may improve the recovery of photodamaged skin. Photo of flowers, consisting of pink, tubular-shaped corollas with protruding brown/maroon anthers. Photo of flowers, showing well the anthers which have an opening at their very ends from which pollen isliberated. Photo of flowers against a dark backround. Photo of inflorescence - numerous flowers held by flexible, partly curved pedicels. Photo of flowers (front side) showing the numerous anthers (about 8-10) protruding out from the corolla. Close up photo of laterel view of flowers showing the 5 slender sepals of same colour of corolla, and hence rather inconspicuous. Photo of another inflorescence, with many flowers radially projecting out from the common flowering branch. Photo of flowers with their slender,long, pink pedicels. Scanned image of flower clusters against a dark background. Flowers usually grow at the apex of the flowering branches, but sometimes they are also found at the central part (lower from the apex). In rare ocassions, inflorescences are found in bothe mentioned locations. Scanned image of the long flower stalks (pedicels) which makes makes flowers assume a slightly pendulous position. Scanned image of a crowded inflorescense. This type of inflorescense is described as a raceme. Photo of a plant with very pale flowers, nearly white. The plant show a certain degree of variety in the colour of its flowers ranging from off-white lilac to vivid pink (magenta). Albinos of this species have been observed in Malta, and these pale pink flower forms may be just intermediates between normal and albino specimens. Photo a plant with pink-magenta flowers, contrasting well with previous photo which shows a whiter form of flowers. Magnified scanned image of 3 dissected flowers. They have pink pedicels and an inflated tubular corolla. Magnified and annotated scanned image of 3 dissected flowers. The flowers at the middle and right side are taken from the same specimen. Magnified scanned image of a single flower (lateral view). Note the central pink stripe on the tiny sepals and the 2 flap-like bracts at the base of the pedicel. Scanned image of disected flowers to show arrangement of stamens and pistil. The central inferior ovary is purple. Each flower have 8 stamens, some have been removed in this image during disection. Photo of inflorescences in situ. As it is shown, the plant produces large numbers of flowers. 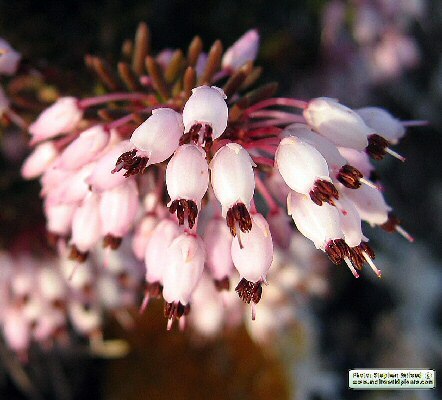 Another photo of the flowers of Erica multiflora in situ. Close up photo of the pink flowers with their brown protruding stamens. Close up image of the brown anthers with a pit (hole) at the tip making the anther to look like a hollowed tube. Scanned and magnified image of few disected stamens. Note a characteristic feature of the Ericaceae (Heath family), hence the hole at the end of each anther from which pollen is liberated. A variant of the E. multiforma growing on Malta which is able to form flower clusters at the central part of the leaf, hence not only terminal inflorescense. Photo of the tiny bracts present between the flowering branch and the pedicels. Photo of shoots and leaves in situ. They are so dense that the woody stems are not visible. Scanned image of individual linear shaped leaves. The sizes are anotated in the image, but the length can vary by few more mm. Note the interesting white groove at the center of the lower side of the leaf. Photo of the common habitat of the plant, hence gaps, cracks and spaces in bare rock of garigue or heathland in an exposed location. The plant tollerate cold temperatures and wind and one of the uniques species of Erica which tolerates slightly alkaline ground, compared to the rest which grow in acidic soil. Scanned image of a twig of the plant showing the highly branched and woody stem, whorls of needle like leaves and terminal flower clusters. Photo of plant in situ. It is very branched and so described as a small bush. Photo of plant in situ. Note the reddish brown colour of the shoots. Photo of plant in situ. This plant is in full bloom and it has many flowers that make the plant look more pink than green. Another plant in its natural habitat in the Maltese islands. It grows in rocky habitats namely garigues and pre-desert scrub. Black and white illustration of the plant taken from Handbuch der Laubholzkunde by Dr. Leopold Dippel.